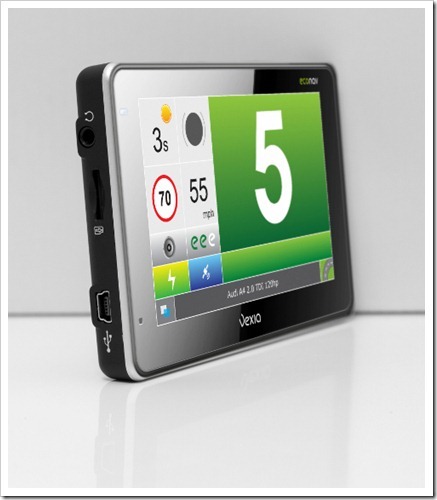 This review looks at the Vexia Econav 380 Sat Nav. 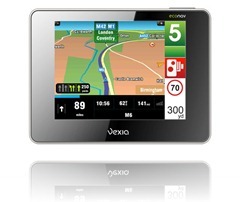 Vexia is a name you might not immediately associate with the sat nav market, it is a Spanish brand developed in 2008 to encourage eco friendly GPS navigation. 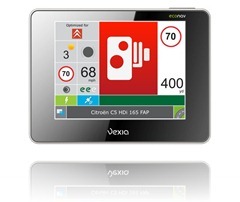 The Vexia Econav works like any traditional GPS navigator, but with features built-in to encourage you to drive more economically and thereby save money on your fuel bills. The eco market is an area several manufacturers have moved into over the last 18 months, both Garmin and TomTom have developed systems which allow a user to navigate using the most fuel efficient route. Vexia take this a step further. Not only can it calculate the most fuel efficient route, but it also provides visual and voice instructions indicating when to change gear. It does this by storing the vehicle profiles of over 11,000 models of car. You simply select your car model and make when first setting up the system. In addition to giving instructions on when to change gear, it also provides visual warnings if you accelerate or brake too quickly, as well as displaying the safe stopping distance based on current speed. We reviewed the Vexia Econav 380. There is also an Econav 480 if you prefer a widescreen version. Both the 380 and 480 ship with either UK and Ireland mapping, or for a higher price European mapping. We tested the Vexia on the same routes we use when reviewing other GPS systems. On the whole it performed pretty well, selecting appropriate routes. Route recalculation when taking a wrong turn worked well most of the time, although on one occasion it got completely messed up, first telling us to turn right onto a dirt track, and when we ignored that instruction it told us to turn left into a caravan park. 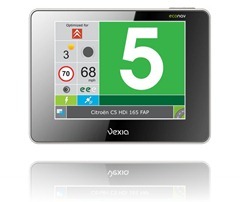 The Vexia displays the speed limit of the road you’re driving on and in our tests it did an excellent job. The correct speed was displayed on all the routes we selected. There is no visual or audible warning if you take a wrong turn, the system will silently recalculate the route for you. If you’re quick and glance down at the screen you will see a progress bar as it recalculates the route, but it is very easy to miss that. We’d like some kind of warning when taking a wrong turn. We couldn’t enter a destination until a satellite signal was established. This can be particularly annoying if you want to check or program a route indoors before a journey. Other manufacturers provide an “offline” mode where you can calculate a route without a satellite signal. We found the screen too small. The information bar displayed at the bottom of the screen showing details like time of arrival and current speed was too small to read. It’s possible things are slightly better on the Econav 480 which has a wider screen, but we feel the display needs redesigning to improve readability. 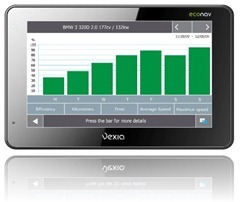 The left hand side of the econav screen tries to convey too much information in our opinion making the screen look cluttered and unreadable. The right hand side of the screen looks much better. We also found ourselves looking at the screen more often than a traditional GPS navigator to read this information, which could prove a distraction when driving. Sometimes less is more, and we’d like to see less information on this screen. At slower speeds, such as driving in urban areas, you may find the Econav is continually asking you to change up and down gear. In our tests we were driving at 30mph in a built-up area, and it kept asking us to change up to 4th and then back down to 3rd, since our speed was drifting a couple of mph either side of what it felt was time to change gear. This got a bit annoying after a while. We tested the Econav 380 on a 2007 Honda Civic 1.8 Sport, which itself includes a series of lights on the dashboard that indicate efficient driving, so it provided a good comparison with the Econav 380. Overall it did a decent job of telling us when to change gear. Of course the Vexia has to use satellites to compute your speed, so you may find a 1-2 second delay before it realises you need to change gear. There are times when the gear change instructions don’t make sense, for example when driving up or down a hill it makes sense to stay in a lower gear, so on these occasions it is best to ignore what the Vexia suggests. The Econav 380 provides a nice series of reports where you can view how efficiently you’ve driven for a particular day, week, etc. Safety camera warnings are pre-installed and in our tests it worked fine with fixed cameras. We did not get an opportunity to test whether it will detect mobile or red light cameras. Safety camera updates are available from Vexia. The points of interest (POI) was surprisingly good, offering a good selection of categories and providing accurate listings for our local area. The Vexia Econav is an innovative looking device with some nice features to encourage more eco friendly driving. As a navigational device we’d still recommend either Garmin or TomTom, both perform better overall, although the Vexia is not far behind. Some people could also argue that driving sensibly is common sense, most people already know that if you don’t accelerate or brake too hard you can save fuel, you don’t need really need a GPS device to tell you that. So we’re not totally convinced this device will catch on. There is a move to making GPS devices more eco friendly though, and this device offers some potential and advantages over the likes of Garmin and TomTom in this department. If Vexia continue to be creative and innovative in this marketplace this could be a device to watch.